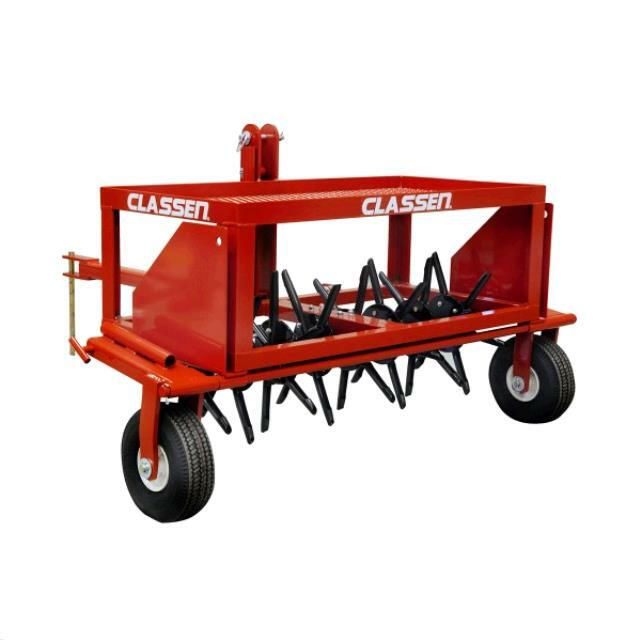 AERATOR 42 INCH TOWABLE CLASSEN 48RT Rentals Ft. Collins CO, Where to Rent AERATOR 42 INCH TOWABLE CLASSEN 48RT in Ft. Collins, Wellington, Greeley, LaPorte, Loveland, Windsor CO and all of Northern Colorado. Total maximum weight, is 780. Minimum horsepower to tow is 18 H.P. Six Weight Containers are included n/c with aerator rental. Water hard dry ground a day prior to aerating for better penetration. Tow at a brisk walking pace for best results. * Please call us for any questions on our aerator 42 inch towable classen 48rt rentals in Fort Collins, Wellington, Greeley, LaPorte, Loveland, Windsor CO and all of Northern Colorado.